IMPT: This page is solely for understanding purposes. We do not intend to create any problems and conflicts at all conditions. This is a section which I personally felt that all house owner must know when comparing prices. Not ALL material are the same. The first thing you want to find out is our pricing. The first question house owner ask is, Why is your price a bit higher? Doesn't it is all the same material, and accessories? and many others. In this section, I will try to explain some of the difference in pricing. Problems- No Capping to cover the screws holes. Back view of standard casement handle. Problems- As this casement handle does not comes with screw to tighten, this type of handle tends to get loosen after a certain period. Pros- Comes with screws cap. Back view of casement handle. Pros- As this casement handle comes with screw to tighten, this type of handle can last longer. In any case the handle got loosen, just by DIY, you can tighten up the screws and instead of changing a new casement handle. Uses only Stainless Steel tapping screws for all tightening areas. Uses only Stainless Steel Stay/Arm with Grade 304 for Casement windows. Pros- Does not cost rustiness. We uses 25mm x 25mm x 1.6mm thick hollow sections for both window grilles and gates. 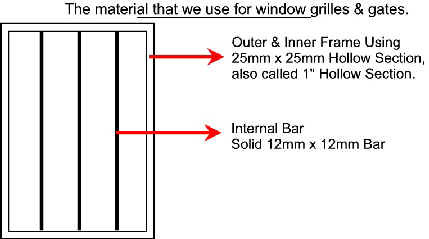 Some uses 19mm x 19mm hollow section for window grilles and gate might be varies. We uses 12mm x 12mm solid bar and acting as a security. Some uses 12mm x 12mm hollow bar as it looks similar to the solid bar from outside view.